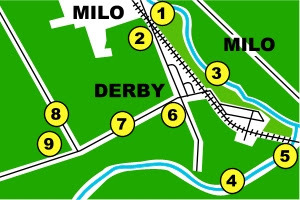 This topic about the border between Derby and Milo was requested by email from a well known political radio and television talk show host in Maine, and fellow classmate at Milo High School, class of 1967. He recently gave up the bright lights and microphone, but with luck I will convince him to continue scrutinizing Maine politics with a blog. Some readers may remember Al Gore’s claim that he invented the internet. I claim informal high school political debates during study hall launched the fame and broadcasting career of my famous friend. I’ll recant if Al does. Here’s my take defining the suburb of Derby using points of reference from 1950. From Riverside Street (1) going south towards Derby, the railroad tracks (2) just before Derby Hill form the unofficial border. The Sebec (3) and Piscataquis (4) Rivers meet at Indian Island which is on the Milo side, and form the eastern and southern borders of Derby. Cross either river by swimming, rafting, or walking the railroad tracks across the Iron Bridge (5) near the B&A; Shops, and you enter Milo. *Note: Sections in green are forest. From the foot of Derby Hill (6) and turning west, River Road (7) intersects at Billington Road (8) with one home and the Carl Ricker farm (9). This area was considered Derby for another mile west from Billington Road to the second Ricker dairy farm on River Road. That last mile without homes in between was uncivilized boondocks and rarely visited except to fish Rickers Brook for trout. Other than camping, fishing, or school trips, and an occasional visit to Bangor or the coast, this two square mile area was my universe. Unless you grew up in a rural village, you may not understand the joy and adventure of life in a small town with the outdoors as your playground. It cannot be relived. It will be remembered.